Dr. Daniel Hinshaw, Notre Dame Institute for Advanced Study fellow, presents at an institute seminar. Life is not possible without death and yet, modern medicine has waged an unending war against death. Now, a Notre Dame Institute for Advanced Study (NDIAS) residential fellow is exploring how the concept of kenosis might create a common ground for personal growth, mutual understanding, civil discourse, and productive policymaking in today’s diverse and polarized society. 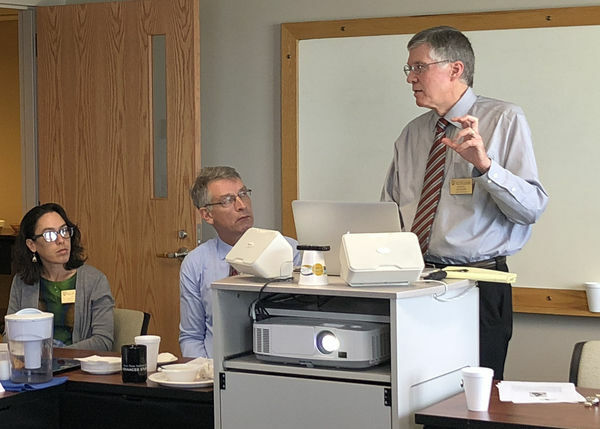 Daniel Hinshaw, M.D., professor emeritus of surgery and consultant in palliative medicine at the University of Michigan Medical School, has joined the NDIAS for the 2018-2019 cohort to discuss kenosis in his upcoming book. In Classical Greek, “kenosis” meant “depletion” or “emptying,” and in Christian theology, the term was used to describe the voluntary self-emptying of God in becoming a human being in the person of Jesus Christ. Hinshaw says that rather than being a source of despair, a voluntary embrace of kenosis, and thus our mortality, can become a tutor or mentor that guides each of us to reconsider our priorities. Hinshaw proposes to explore the broad implications of kenosis beyond its impact on personal reflection and spiritual growth to also include the potential transformation of priorities in healthcare, biomedical research, education, ethics, politics, culture, the arts, as well as stewardship of the earth and its resources. For example, he argues that if people began to accept their inevitable kenosis, they might take more personal responsibility for their health. With this more realistic understanding, Hinshaw believes there is the potential to improve healthcare through greater use of preventive medicine and increased health education from an early age, which could ultimately lead to better health as well as a reduction in costs as the use of expensive rescue strategies in the advanced stages of disease would decline. Further, he worries that although documents such as the Declaration of Independence and U.S. Constitution focus almost exclusively on the individual’s right to pursue happiness, such a philosophy, if not balanced by a concern for the other, could make “monsters of us all.” However, reflection on the unavoidable nature of suffering and death, with the kenosis of aging as a reminder, is a commonality everyone shares and may guide a more altruistic form of human exchange in all aspects of life. Throughout Hinshaw’s stay at the NDIAS, he also plans to explore the deeper existential opportunities presented to those who make use of their kenosis to redefine their lives. Hinshaw previously authored two books titled Suffering and the Nature of Healing and Touch and the Healing of the World. To learn more about Hinshaw and his fellowship at the NDIAS, please visit https://ndias.nd.edu/fellows/hinshaw-daniel-b/. The NDIAS supports research that is directed toward, or extends inquiry to include, ultimate questions and questions of value, bringing together leading thinkers from around the world to live and work at the University as fellows in a residential intellectual community. These cross-disciplinary scholars, scientists, and artists pursue innovative research projects as they engage and contribute to the research of Notre Dame colleagues and students from multiple disciplines, augmenting the life of the mind on campus. The institute strives to be the first place that comes to mind when scholars and scientists embark on major inter- or multidisciplinary projects that seek to relate specialized academic research to deeper inquiry about meaning and morality. To learn more, please visit https://ndias.nd.edu/. Originally published by Brandi Klingerman at research.nd.edu on August 30, 2018.